You may be tested to look for signs of osteoporosis. This can be done with a bone mineral density test . Get plenty of calcium, vitamin D, and protein in your diet. Talk to your doctor if you think you need supplements . If you have osteoporosis, you should talk to your doctor about treatment options. If you had an early menopause , talk to your doctor about this. If you smoke , talk to your doctor about ways to quit. 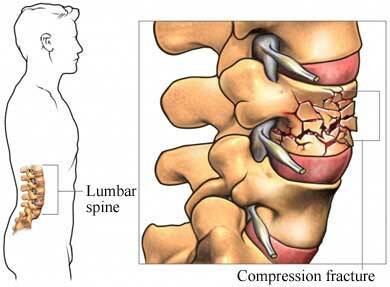 Thoracolumbar vertebral compression fracture. EBSCO DynaMed Plus website. Available at: http://www.dynamed.com/topics/dmp~AN~T114371/Thoracolumbar-vertebral-compression-fracture . Updated September 16, 2016. Accessed December 19, 2017. Vertebral compression fractures. American Association of Neurological Surgeons website. Available at: http://www.aans.org/Patients/Neurosurgical-Conditions-and-Treatments/Vertebral-Compression-Fractures. Accessed December 19, 2017. 12/19/2017 DynaMed Plus Systematic Literature Surveillance http://www.dynamed.com/topics/dmp~AN~T114371/Thoracolumbar-vertebral-compression-fracture : Buchbinder R, Golmohammadi K, Joshnston RV, et al. Percutaneous vertebroplasty for osteoporotic vertebral compression fracture. Cochrane Database Syst Rev. 2015;(4):CD006349.